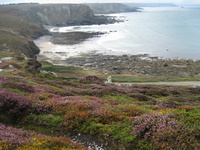 Some of the most interesting places on France’s Atlantic coast are quite remote. 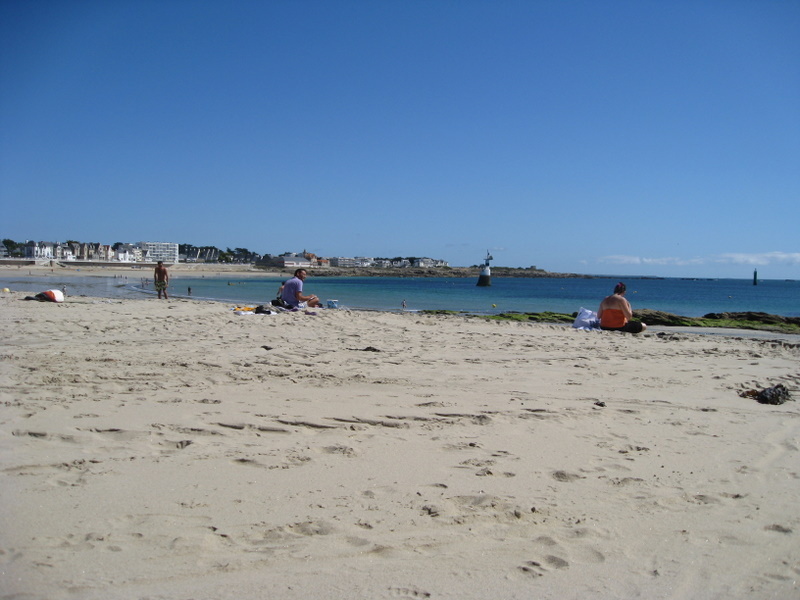 We spent two nights on the presqu’île of Quiberon, in southern Bretagne. 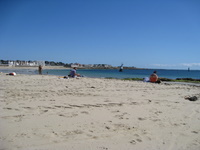 The beaches are lovely, and the town of Quiberon is kind of cute, but the others on the peninsula are nothing special. 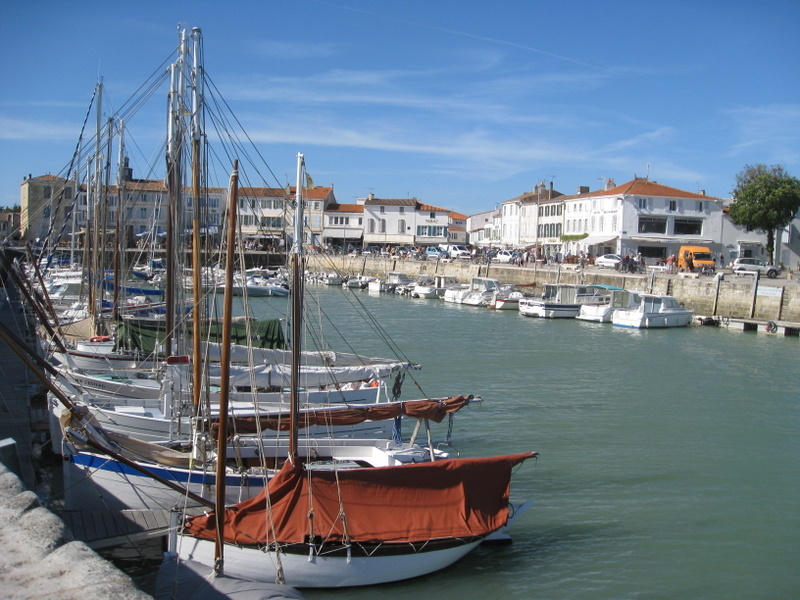 In contrast, Île de Ré, in Poitou-Charentes, is home to numerous cute towns (including two Most Beautiful Villages). We spent three nights in Sainte-Marie-de-Ré, and enjoyed talking to our hosts about the boom in housing and tourism that has occurred there since the car ferry was replaced by a toll bridge in 1988. Fortunately, there aren’t as nearly as many houses as there could be, as a lot of the land is covered in grapevines; as for the wine, however, c’est pas terrible. In Aquitaine, the small town of Soulac-sur-mer is filled with lovely, unique villas, as are a few streets in the much larger Arcachon. They both also have beautiful beaches and I can easily imagine living in either town for a year or two. A short drive from Arcachon is the Dune du Pilat – at 107 meters, it’s the largest sand dune in Europe. The climb up can be a bit difficult, but the view from the top is extraordinary. 6 corners of the Hexagon: Third corner! The exact location of the third corner isn’t obvious like the others. The westernmost point of France is l’Ã®le d’Ouessant, but we wanted to stick to the continent for the purposes of our hexagon. 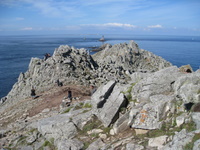 The westernmost point of continental France is Pointe de Corsen, which is considered the theoretical divider between the English Channel and the Atlantic Ocean. (Source: Pointe de Corsen, Terres celtes) In looking at a map of France, however, this point doesn’t exactly stand out. We feel that the part of Finisterre that pokes out just north and south of the Crozon peninsula is more corner-like, so we decided that those points together constitute the third corner. 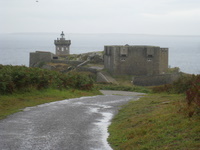 The point to the north is Kermorvan, a small cape with a lighthouse near the town of Le Conquet, from which the ferries to Ã®le d’Ouessant leave. It was incredibly windy the day we visited, and one of our umbrellas, already fragile from Bretagne’s infamous weather, more or less self-destructed, leaving behind a naked skeleton with the ripped waterproof material flapping in the wind. It was a memorable visit. Our second contender to the third corner crown was la Pointe du Raz, which turned out to be an internationally renowned, protected site, and was far more popular among hikers and picnickers than we’d expected. 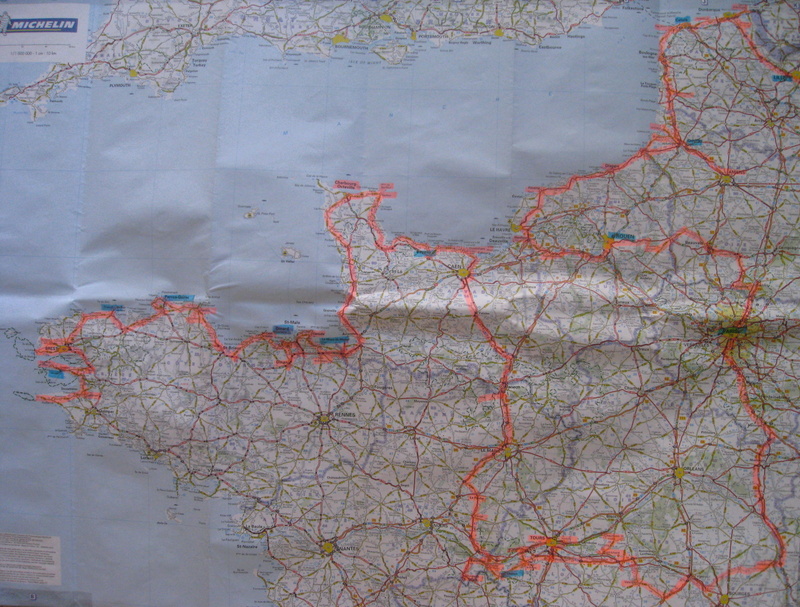 Here’s our map from the second corner to the third, complete with detours to Paris and Loire Valley. 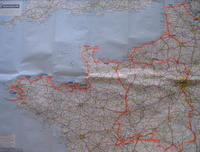 Remember that pink indicates our route as well as towns we actually walked around and/or ate in. Blue highlights where we stayed. You can click the map to see a much bigger version. We only spent a few days in Bretagne, and it rained most of the time; nevertheless, the entire coast is breathtaking and I look forward to returning for a longer stay. In Perros-Guirrec, we took a boat ride around the Archipel des Sept-Îles nature preserve, during which we admired thousands of breeding pairs of Northern Gannet seabirds on Île Rouzic, and then cruised along the famous Côte de Granit rose. It was cold and rainy; I can only imagine how much more beautiful the pink granite is when the weather is nice. 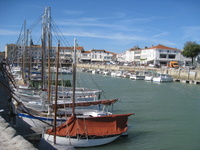 Next we spent two days in Morgat, a small town on the Crozon peninsula in Finistère. This remote area is incredibly beautiful and surprisingly colorful; during our visit in late August, nearby Pointe de Dinan was covered in purple heather and other vegetation. We also took a cruise of the Grottes marines de Morgat, the “painted” caves accessible only by sea. Celebrate Arbor Day by joining the Arbor Day Foundation. For $10, you get to help fight deforestation as well as 10 trees to plant anywhere you like. 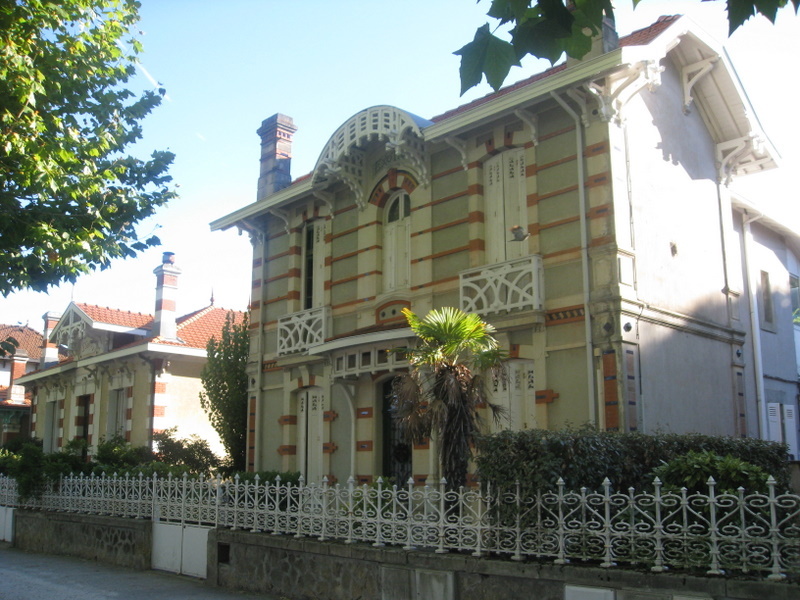 On 5 and 6 April 2008, the southern French city of Hyères hosted its annual flower festival with an open day event at SICA (Société d’intérêt collectif agricole) / Marché aux fleurs d’Hyères. 500 growers produce over 180 million flowers a year, making it the largest flower market in France and the fourth largest in Europe. With information booths, wine and flower tasting, and a flower parade, it was a fascinating look at this colorful aspect of the Hyérois community. I guess this is old news, but somehow it completely passed me by. 40% of the world’s oceans is covered in garbage – primarily plastic – concentrated in 5 enormous gyres, or vortexes. I can’t even wrap my head around the staggering amount of garbage this represents. There’s a stretch of land between Casablanca and Rabat, Morocco, that is just covered in plastic bags as far as the eye can see. It’s the place where Plastic Bags Go To Die, or so I thought. 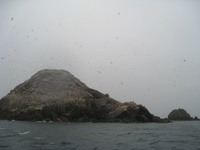 Apparently, it’s just a stopover on their way to join their brethren in the oceans. Plastic bags are absolutely everywhere. In both Morocco and Costa Rica, they’re stacked high in shops, and it’s not uncommon to walk out of a store with $10 worth of groceries in 3 or 4 bags. Even though we bring bags with us, the baggers always seem to be trying to give us more bags, as if to make us feel we got our money’s worth. In the US, the “paper or plastic?” debate was never really resolved. Even our local natural foods store offerred both – though at least they were usually reused. I don’t know. It’s not as if I have some amazing insights to share on this subject, but I just couldn’t bear to ignore it. Here’s more info, if you’re interested. Our Oceans Are Turning Into Plastic… Are We?